And so, onto the giveaway! 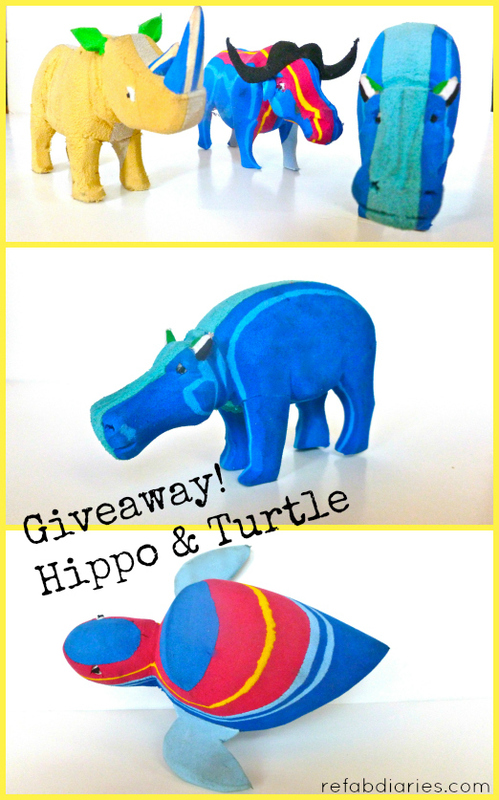 Enter for a chance to win the Hippo and Turtle pictured above. The Hippo is a peaceful shelf creature. He doesn't need a lot of maintenance! The Turtle will do a little work for his living. He's actually a doorstop. But he'd made a pretty fun bath toy too. Please note: THIS IS NOT a sponsored post. I own the items I'm giving away and am promoting the FlipFlop Recycling Company as a goodwill gesture. 54 comments on "Giveaway: Recycled FlipFlop Fauna! " wow. hippos and turtles are two of my favorite animals!! That is so cool!! I love to see the creative ways people are recycling things! THis is fabulous! 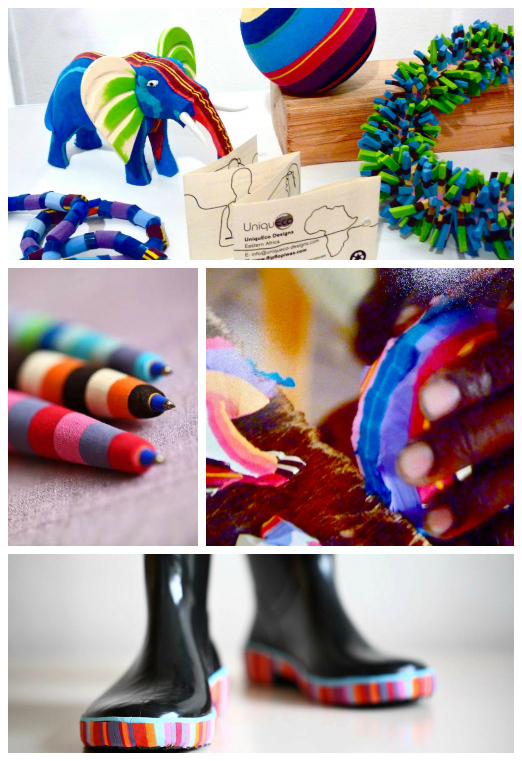 What a great way to re-use bright and colorful flipflogs! these are amazing!!!! what a great idea to not only make something adorable but also to save our planet! This is the most unique and awesome idea I think I have ever seen. I love this idea! This has to be one of the most creative thigs I have ever seen! I LOVE it!!!! I would love to win the turtle for my school! We are the Sunrise Sea Turtles and I received a grant which enabled my class to collect and send used flip flops to UniquEco. We sent 17 boxes before the money ran out. We did receive a thank you, but it would sure be nice to have something tangible as a symbol of our efforts and partnership! Carol - thank you for letting me know! Good for you and your students!! I use random.org to pick a winner for my giveaways. If you don't win, I will figure something out - ok? These are fantastic! I love how colorful they are. oh my gosh this is so amazing! how fantastic that they can be recycled in such a way. I'm commenting for Carol and the Sunrise Sea Turtles - hope they get it! So beautiful and so creative! I love them all! I am thoroughly impressed with this company and the honorbale work they do. Looking at the pictures, I see a pair of boots made with soles of recycled flip flops. OMG...Why have we not seen shoe and boot comapnies endorse the use (reuse) of flip flops for their soles. What a waste these comapnies do by not making use of used flip flops for soles! Kudos for the "Flip Flop Recycling Company"! Thank you so much for sharing this company! I love the idea, and it's amazing what they do. These are so cute. I would never guess they were flip-flops. So cute and clever! I'll gladly donate mine to Carol's school! adorable! would never have thought of that. thanks for the giveaway! This is incredibly cool. What a great way to recycle?! I love seeing how people can be creative using resources that are already there. Great work. What an amazing idea!! So creative! What an awesome way to recycle, everything looks amazing! 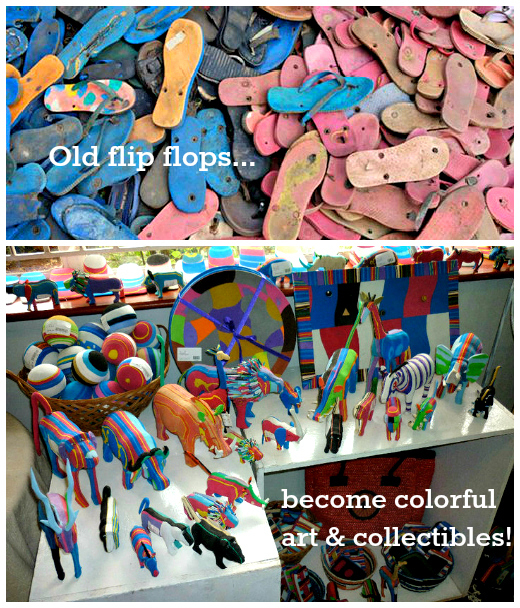 What a great idea to recycle flip flops! Thanks for the giveaway! Amazing! I cannot wait to show this to my kids! What a great way to recycle and also make lovely art...I love it! That is so neat. Love this idea! Thanks for the giveaway - these are great! I love them! What a fantastic idea! These are adorable! I am so grateful when I see someone reusing and upcycling what might ordinarily be thrown out. I am so excited to find your site - it will be perfect for my girl scout troop! What a great idea! Those colorful animals are very cute. so neat! i love upcycling! This is a great recycling project. Such cute animals. Really like the colors. Great ideas and co creative! I love them all! adorable, and being green makes them even cuter to me! I have never seen anything like these! All throughout hs and college I collected hippos...you have no clue how bad I want this!!! So funny, I wanted to comment the same....up cycling rules! This is genius. I'm so glad to learn about this company. Not only are the items they create via upcycling rediculously cute, they are providing a valuable service by helping to rid the world left-over flip-flops. How incredibly creative and beautiful! These are so cute!!! What a unique and creative way to recycle flipflops!